Extant species have wildly different chromosome numbers. For instance, the Adder’s tongue fern carries up to 720 chromosomes while the Jack Jumper ant has the smallest possible chromosome number (the haploid chromosome number is called “n”) of n=1. It’s amazing that the Jack Jumper ant (which has a typical insect-sized genome) has packed its whole genome into one giant chromosome. Probably the greatest interspecific karyotype variation in the animal kingdom was found in blue butterflies (Lycaenidae: Polyommatinae) of the genus Polyommatus with haploid chromosome numbers ranging from n = 10 to n = 223. The brewer’s yeast Saccharomyces cerevisiae has 16 pairs of chromosomes in its diploid state. Why do different species have different values of n? Is it possible to fuse 16 chromosomes in budding yeast into 1 giant chromosome? Here we developed a new method we call karyotype engineering to explore the tolerance of chromosome number changes in a species. I joined my mentor Jef Boeke’s lab five years ago as a PhD student when the synthetic yeast genome project (Sc2.0) was still at an early stage. My thesis projects were assemblies of two synthetic chromosomes, I and VIII. Chromosome I is the smallest chromosome in yeast, and synI will be much smaller than its wild type counterpart after removing subtelomeric regions, retrotransposable elements and so on. Due to concerns about potential instability of a downsized synI, it was designed to be attached to another synthetic chromosome in the final Sc2.0 yeast to make it larger1. I took advantage of CRISPR-Cas9 to fuse chromosome I to other chromosomes in S. cerevisiae. This method worked very well and all the fusion chromosome strains (n=15) were very healthy1. In one of my committee meetings on Jan 2016, Brendan Cormack noticed the robustness of this method and raised an interesting question which changed my research trajectory: how many chromosomes can you fuse together in Saccharomyces cerevisiae? This is how the fusion chromosome project started in New York. The chromosome fusing process went on quite smoothly until the final step – trying to get n=1 strain. We designed our favor strategy based on some speculations about potential obstacles rooted in theory (Figure 1). I optimized the CRISPR-Cas9 protocol so that about every week we could got a new fusion chromosome. At first, we thought that we might stop at n=4 because the minimum chromosome number in the Saccharomycetaceae family found in nature is 4 (Pichia pastoris). When we got an n=2 yeast, we were very excited. I spent five months to reduce the chromosome number from 12 to 2, while I spent another nine months to try different strategies that we could think of to get n=1 strains. I tried different arm lengths (balanced and unbalanced), varying the identity of the remaining telomeres and Sir2 deletion (we were concerned that enhanced telomere position effect might hyper-silence some essential genes residing near the remaining telomeres), and even circularization of long compound chromosome. For some of the strategies, I was able to use the same combination of gRNAs and donors on strains with different values of “n” to perform the designed fusion, which indicates that it was likely a configurational rather than a technical problem with the CRISPR reagents used. Later, thanks to a wonderful fellow graduate student Xiaoji Sun’s help, we analyzed potential genome structure rearrangements and transcriptome changes, helping us to characterize fusion chromosome strains. Amazingly, fusion chromosome strains went through mitosis and meiosis very well, suggesting that variations in chromosome numbers “n” mostly reflect accidents of history. 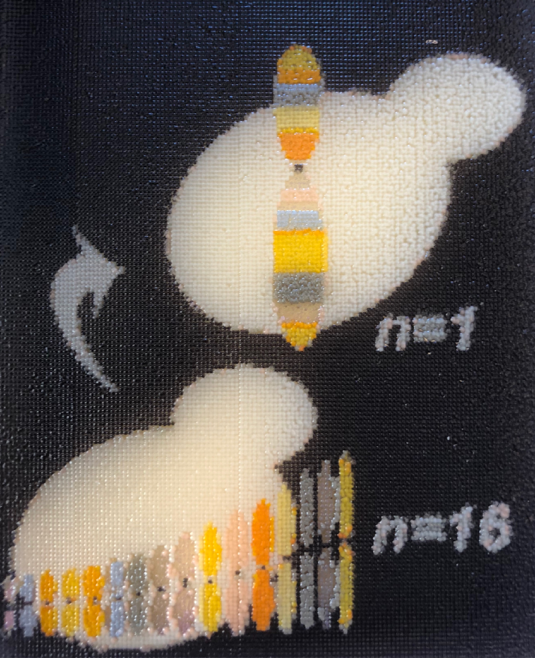 Figure 1 A yeast art print showing our fusion chromosome strategy to fuse n=16 into n=1. Each “biopixel” (there are ~25,000) is a live yeast encoding different colour pigments. Yeast art was designed and printed by Jasmine Temple of NYU Langone Health. Chromosome fusion is correlated with reproductive isolation, thought to be a key initial step in the process of new species formation. A certain level of isolation in reproduction allows accumulation of spontaneous mutations and other sequences variants, leading to speciation. However, the question about the quantitative contribution of chromosome fusion to reproductive isolation remains unknown because so many other factors also contribute to reproductive isolation in extant species, such as sequence variation. We used our near-isogenic fusion chromosome strains to test this question by mating them to wild type chromosome yeast (n=16) and studying sporulation efficiency and germination success rate. We found that 8 chromosome-chromosome-fusion suffices for virtually complete reproductive isolation. By comparing our strategies and theirs, we think that a few factors may contribute to the reasons why we did not get n=1 strain. Our strategy, as died in the wool geneticists, was to try to maintain isogenicity at all costs, so we tried to minimize the size of deletions made when fusing telomeres and centromeres. Their group thought downsizing was important - and perhaps they were right - so they eliminated 19 long repeated sequences, which add up to about 137 kb. This not only partly decreased the total length of the chromosome, but also reduce the chance of undesired homology recombination in genome, which might help with instability. Secondly, in their configuration, arm lengths are quite balanced if we take into consideration the variable length of the rDNA array, with left arm (4.84 Mb + 1 ~ 2 Mb rDNA array) and right arm (~ 7 Mb). Thirdly, the distance between the rDNA array and the active centromere is different between our strains and theirs. They have a shorter distance around 1.25 Mb, while ours is 2.45 Mb. In a paper studying 3D structures of yeast cells in different phases of the cell cycle3, a loop was predicted to form between the rDNA locus and the centromere, probably by extrusion during anaphase. Not much is known about the function of this loop. With a longer distance between rDNA locus and centromere, the resulting very long loop formation might be impeded, which may or may not affect cell cycle progression. Last but not least, there are six non-synonymous mutations in n=1 strains, which did not show up in our strains. Perhaps these mutations include some potential suppressors for n=1 strain survival. Thank you Jef D. Boeke for his great input in this blog and thanks to the US National Science Foundation for the grant MCB-1616111 that funded our work. Our papers: Luo, J., Sun, X., Cormack, B. P. & Boeke, J. D. Karyotype engineering by chromosome fusion leads to reproductive isolation in yeast. Nature, doi:10.1038/s41586-018-0374-x (2018). 1 Luo, J. et al. Synthetic chromosome fusion: effects on genome structure and function. https://www.biorxiv.org/content/early/2018/2008/2001/381137 (2018). 2 Shao, Y. et al. Creating a functional single chromosome yeast. Nature, doi:10.1038/s41586-018-0382-x (2018). 3 Lazar-Stefanita, L. et al. Cohesins and condensins orchestrate the 4D dynamics of yeast chromosomes during the cell cycle. EMBO J 36, 2684-2697, doi:10.15252/embj.201797342 (2017).